Vivint Doorbell Camera detects, auto-records, and notifies you when someone approaches your door. A wide-angle lens and night vision record clear video 24/7, so porch pirates don’t escape undetected. Built-in two-way talk gives you the option to warn bandits off. 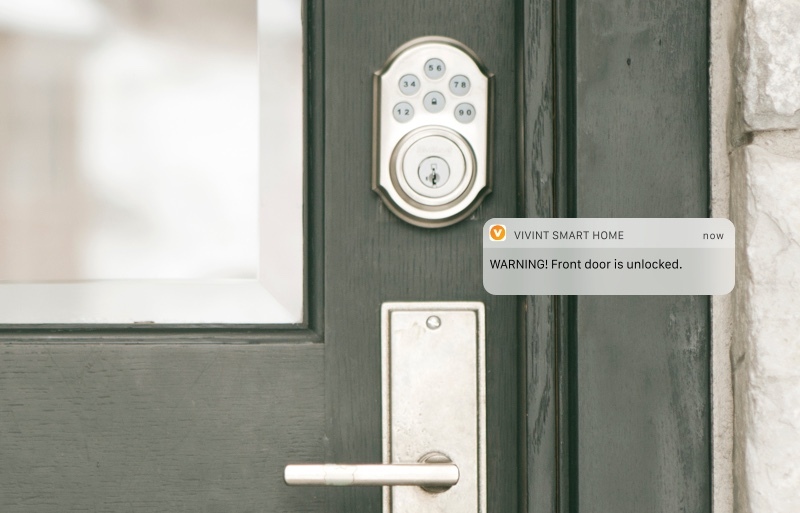 Kwikset Smart Locks let you control your front door on Vivint Smart Home mobile from the gym, the coffee shop, or the office. Plus, you can set mobile alerts for when you forget to lock up. That way hectic mornings don’t become entire days fretting you left the door unlocked. 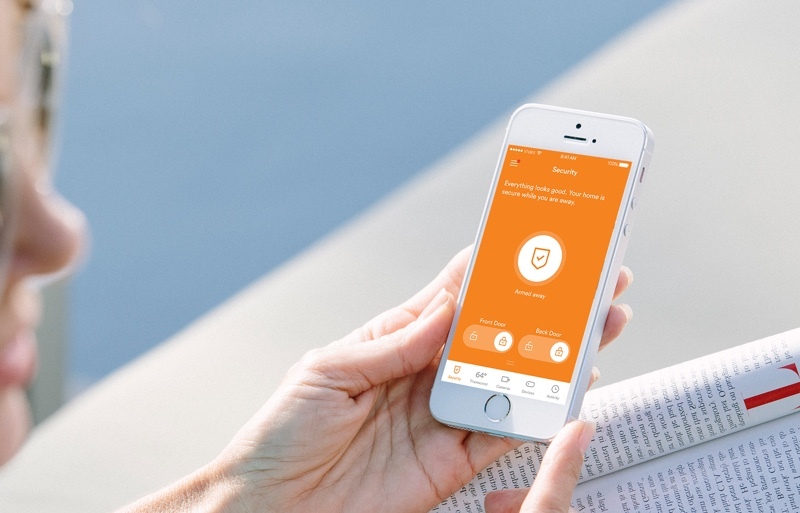 The Vivint Smart Home app connects you to your home security systems from anywhere. Its 4.5-star rated user experience sends alerts whenever smart door locks, security cameras, or security sensors sound an alarm. So if a security alarm goes off when nobody’s home, you still hear the sound. Vivint SkyControl Panel brings all your home security controls together onto one touch-screen dashboard. The intuitive layout makes navigating between your various devices effortless. 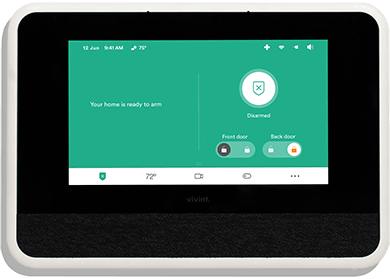 And the two-way talk with one-touch callout gives you a direct communication link to Vivint Smart Home security monitoring teams. 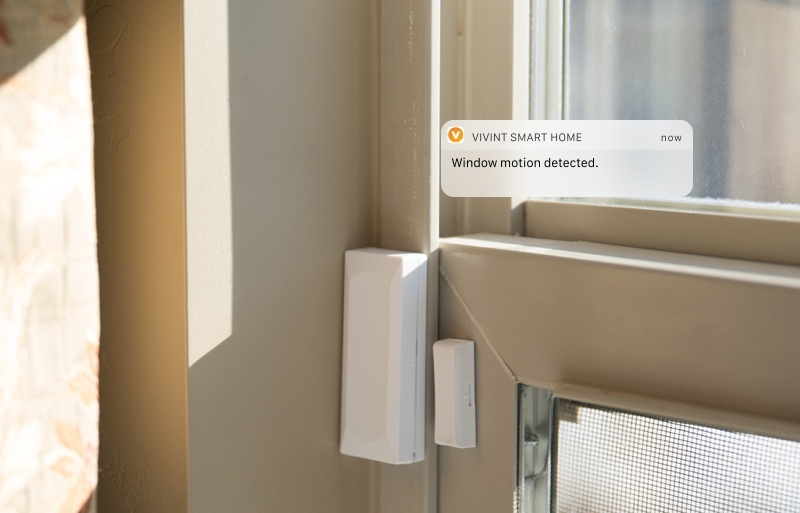 Vivint Smart Sensors protect any entry point an intruder might come through, not just your front door. The security alarm sounds any time a protected entry point opens unexpectedly. Alarms send alerts to your Vivint SkyControl Panel, Vivint Smart Home mobile app, and Smart Home Pros security monitoring teams. 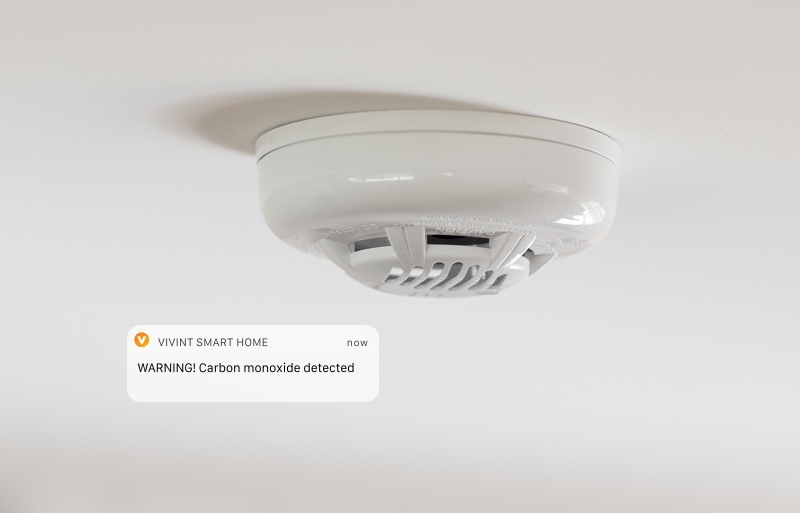 Vivint Carbon Monoxide Detectors use electrochemical sensors to alert you when toxic gasses reach hazardous levels. That way a malfunctioning furnace won’t turn into a life-threatening situation. Unlike stand-alone security devices, all our sensors connect to Vivint Smart Home Cloud to give you easy monitoring and support. Flood/freeze sensors guard against the most common kinds of flooding—the ones that originate inside your house. From clogged drains to pipes that may freeze then split, you can set alerts based on probability to notify you when sensors detect flood conditions like cold temperatures or high humidity. The middle of a weekday when no one should be at home, Joanne gets a mobile notification from Vivint Smart Home indicating a motion detector has triggered the security alarm. Somebody’s in her house. Vivint Smart Home monitoring teams contact police. The burglar runs off. Police arrive within 10 minutes. A few weeks after installing a home security system, Amanda, wakes one night to blaring smoke alarms. A fire is spreading through her house. 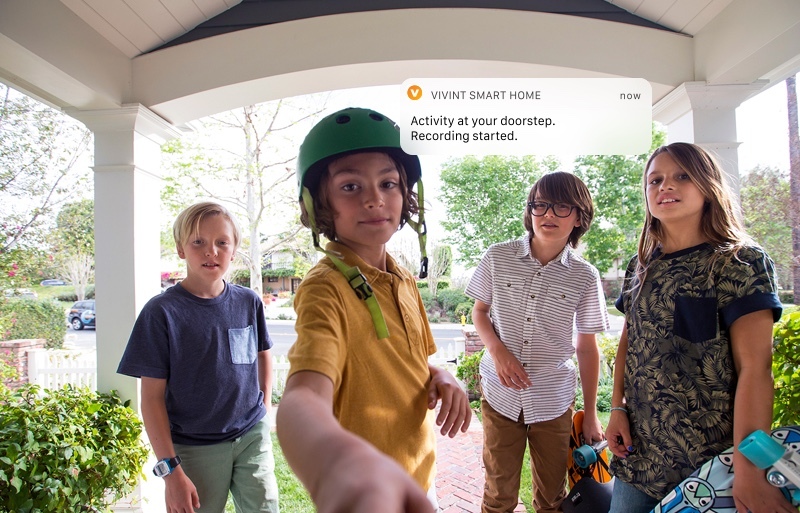 Amanda leads her six children to safety while Vivint Smart Home security monitoring teams call 9-1-1. While Eric is upstairs entertaining dinner guests, one of his dogs is downstairs treating a water line like a chew toy. When the security alarm sounds, Vivint Sky says a flood sensor detects water downstairs. Eric acts fast, shuts off the valve, and handles the situation with a mop instead of a home renovation. Late one night, the Bennett family wakes to an activated alarm triggered by their carbon monoxide detector. Firefighters arrive to find indoor air almost fatally toxic from a natural gas leak at the water heater. 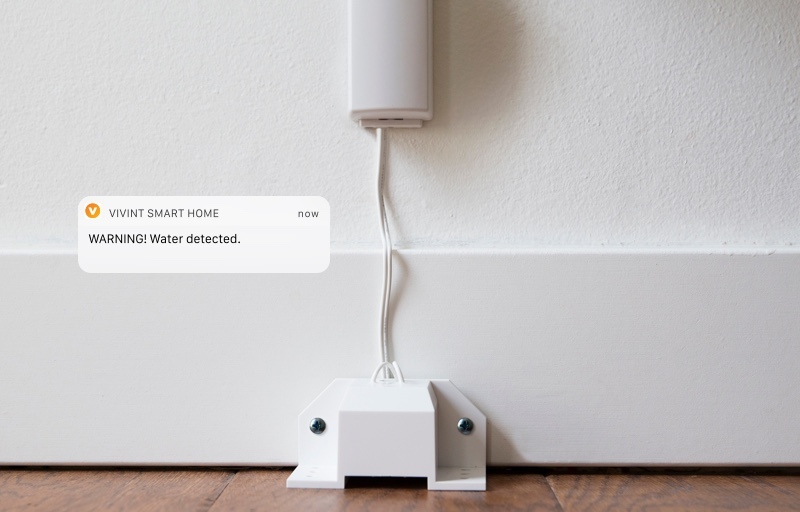 Flood/Freeze Sensors — Protect homes from water damage and pipe-freezing low temperatures by sending mobile notifications when temperatures drop, or moisture levels rise beyond set parameters in or around your home. Outdoor Camera — Wireless, HD security camera with infrared night vision that gives you on-demand access to a live video feed and sends notifications to your phone when someone approaches your door. Motion Detector — Infrared motion sensor with 90-degree look-down to ensure nothing passes by undetected. Smoke Detector — Uses photoelectric sensing to detect heat increases. Door & Window Sensor — Sounds an alarm whenever protected doors and windows are opened and can also be used to protect medicine cabinets, gun cabinets, or the door to a child's bedroom. To learn more about how to protect your home, click here. The total cost of a home security system can be measured in three phases: purchase price, installation costs, and operating costs over time. Purchase price varies by provider, equipment package, and payment options. 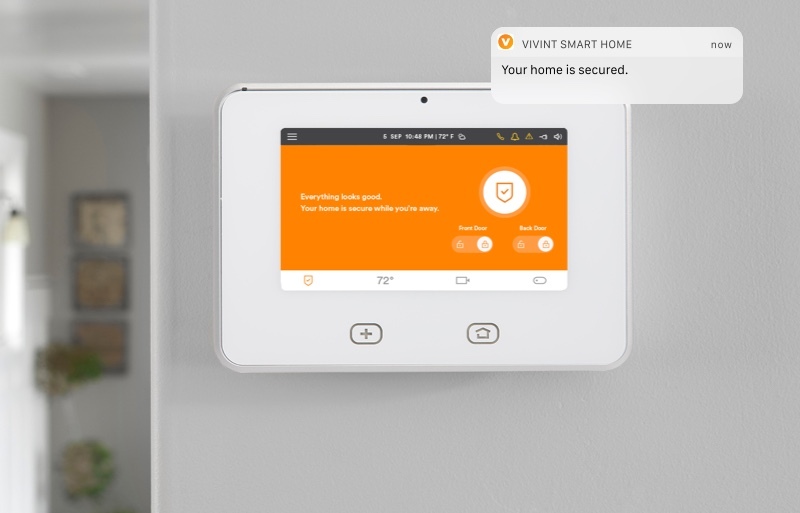 Vivint Smart Home, for example, offers a consumer financing option that gives customers the ability to customize a state-of-the-art smart home security package for little to no upfront cost. Learn more about consumer financing here. Some of the lower-quality home security systems come with only basic door & window sensors that customers can easily install themselves. More high-end equipment packages, like the ones Vivint Smart Home provides, come with a touch-screen control panel and the option to add outdoor home security cameras, all of which require professional installation. Professional installation services may cost up to $250, although special offers that waive installation fees are common. Learn more about professional installation services here. The home security market offers many plug-and-play equipment packages that center around an audible alarm to scare of intruders who trigger a door/window sensor. They do not offer professional monitoring, so there’s no monthly service contract involved. Monitored home security systems cost between $20 and $60 per month. Although criminology research suggests most intruders flee at the first sound of an alarm, complete home security offers much more than just crime prevention. Protection from natural disasters, home appliance malfunctions, and medical emergencies should also be considered. In addition to providing more comprehensive protection, complete home security systems that are backed by professional monitoring services may also qualify customers for discounted homeowner’s insurance premiums of up to 20 percent. Learn more about professional home security monitoring here. Learn more about how much home security systems cost here. If you’ve purchased a home security systems that comes with only basic door & window sensors you can easily install those by following the included instructions. More high-end equipment packages, like the ones Vivint Smart Home provides, come with a touch-screen control panel and the option to add outdoor home security cameras, all of which require professional installation. Professional installation services may cost up to $250, although special offers that waive installation fees are common. Learn more about professional installation services here. Copyright © 2018 Vivint Louisiana LLC. All rights reserved.